The Warcraft movie, directed by Duncan Jones, is in a very interesting predicament. Every single video game movie adaptation before it has been bad, and that's not hyperbole. So Warcraft has a lot hinging on it. If it's good, then it will be the first good video game movie ever. If it's bad, then it joins the ranks of awful video game movies. 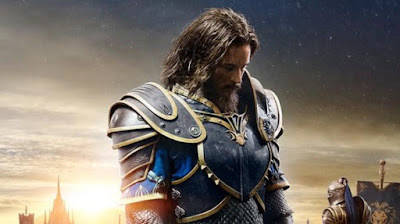 I never played the Warcraft game, but I was interested in the film from a medieval standpoint. I really like medieval fantasy, such as The Lord of the Rings, and I had hopes that this film could be the next big fantasy franchise, since The Hobbit has ended. So I was excited to see a trailer for the film, and now we have one. To be honest, I was underwhelmed. It looked average. The fight choreography looks great, but the CGI looks half-done. The Orcs don't look believable at all, and they look very cartoonish. Maybe that is something that will be fixed by the time the movie comes out in June, but if so, then it was a poor decision to have half-done CGI in the trailer, which is everyone's first look (and impression) of the film. I understood the basic plot, but it doesn't look like it's a very deep or layered story. What made The Lord of the Rings so great was that it had an intricate plot and well-developed characters that you cared about. It had a meaningful story. From this trailer, I can't really tell if Warcraft has all of those elements. It seems like the story is just about territory, which seems kind of dull. I also can't tell really who are the main characters, or what they're going to be like. Overall, I was let down with the trailer. It wasn't a bad trailer at all, but I didn't meet my expectations. However, I still have faith that this could be a great movie! What do you think? Did you like the trailer for Warcraft? Are you looking forward to the film? Leave your thoughts in the comments section below.